Fatty liver disease is sweeping our nation as one of the leading causes of liver damage and progressive health destruction. As such, we are increasingly recognizing how important it is to maintain a lean liver. Although there are many factors contributing to fatty liver disease, experts agree that, besides avoiding alcohol, the most valuable practices for liver health include eating healthfully and shedding excessive weight. According to logic (and researchers from The Netherlands), snacking exerts a tremendous influence on the development of fatty liver disease. Some fat in the liver is normal; however, if fat constitutes more than 10 percent of this organ’s weight, fatty liver disease may be the culprit. Fatty liver disease may be related to alcohol consumption. If so, alcoholic liver disease (ALD) can only be stopped by completely abstaining from alcohol. On the other hand, non-alcoholic fatty liver disease (NAFLD) is much more complex – and impacts an estimated 33 percent of American adults. Although there is no singular cause of NAFLD, experts agree that it is much more likely in those who are overweight or obese. Both sugar and calorie consumption has long been implicated in being overweight and developing fatty liver disease. As published in an August 2014 edition of the journal Hepatology, researchers from The Netherlands hypothesized that a high meal frequency compared to consuming large meals, is detrimental in the accumulation of intrahepatic and abdominal fat. Based on their findings, a high-calorie diet with frequent meals increases fat in the liver – but increasing meal size did not. This study suggests that snacking is an independent contributor to fatty liver disease. Most of us admit that snacking on unhealthy foods poses one of the biggest threats to our plans for getting or staying trim. Despite best-laid plans to consume plenty of lean protein, high-fiber grains and an abundance of fresh fruit and vegetables, hunger cravings easily derail such plans. In order to satisfy between-meal hunger pangs, a filling and tasty treat is frequently sought. Many people’s typical schedule requires them to hustle through their day, leaving little time for healthful snack preparation. Answering the need for on-the-go nourishment, protein bars have emerged as an ideal snack option. However, protein bars vary greatly in terms of their ingredients and benefit – or detriment to – the liver. With a dizzying array of protein bars to choose from in every mini-mart, grocery store or online search, it is hard to determine the liver healthfulness of such a large category. Protein Content – Research shows that protein helps keep you feeling full, contributes to weight loss, and helps repair injured liver cells. Of the different sources of protein, pea protein is one of the best sources for preventing a fatty liver. Derived from yellow split peas, pea protein is a fat and cholesterol free, vegan, plant-based protein. In addition to slowing the production of ghrelin (a hormone that incites hunger), pea protein is not genetically modified and rarely elicits an allergic response. Sugar Content – Many protein bars on the market contain extremely high levels of sugar; some have even more than a candy bar. The lower the amount of sugar, the better it is for liver health. Some protein bars have over 30 grams of sugar, making these items a poor snacking choice for those hoping to keep their liver lean. Calorie Content – As described in The Netherlands study above, snacks that are high in calories contribute to the development of a fatty liver. 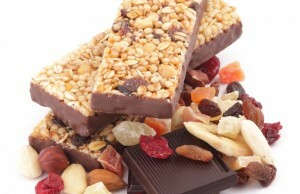 Most nutritionists advise their clients to snack on protein bars consisting of 220 or fewer calories. Some protein bars have twice that amount of calories. Fiber Content – While most people think of a high fiber diet as vital to cardiovascular and gastrointestinal health, fiber also benefits the liver and aids in weight loss. Fiber inhibits the absorption of fats and sugars, reducing fat accumulation in the liver. In addition, fiber helps your liver remove waste from the body, which reduces liver inflammation. Protein – The superfood protein bars are packed with a significant amount of protein (8 or 9 grams) from low-allergen, heart-healthy sources (rice and pea). Sugar – The superfood protein bars are very low in sugar (2 or 3 grams) per bar. The sweetness in the bars comes from the all-natural sweetener, stevia. Calories – The superfood protein bars have the ideal amount of calories as suggested by nutritionists for snacking purposes (190-220 per bar). Fiber – At 6 grams of fiber per bar, the superfood protein bars have a considerable amount of fiber to assist with maintaining a healthy weight. In addition, Natural Wellness’ superfood protein bars are created with whole foods (such as chicory root, chia seeds, green tea, spirulina, flaxseed and coconut oil) that are known to support liver health and weight loss. Snacking on a protein bar is an effective way to lose weight because you are controlling the amount of calories consumed. Pre-packaged, portable and requiring no preparation, protein bars are extremely convenient. As such, they can help people with the biggest hurdle to losing excessive weight – snacking. Munching on high-calorie, high-sugar snacks between meals primes people for developing fatty liver disease. As such, snack carefully by seeking out high-protein, low-sugar, low-calorie and high-fiber ways to satisfy hunger. By choosing a protein bar that hits these marks, you can help your liver stay lean even when hunger cravings hit hard.